Tonight we were supposed to go to the Fringe Festival and get culture and hold hands and maybe have a drink on a patio under a heat lamp and get all gross and romantic, but somehow instead when I came home Nick was just going down for a nap and then hours and hours passed and a show about cheerleaders came on and now he’s watching Silence of the Lambs, even though I am not the kind of person who can hear that sort of thing without internalizing it and making nightmares of it for weeks to come. My favourite movie is “What about Bob?” for good reason. I am going to make him sleep outside the door of our apartment tonight, and possibly for the next several nights to protect the cat and I from having our faces eaten by cannibals. 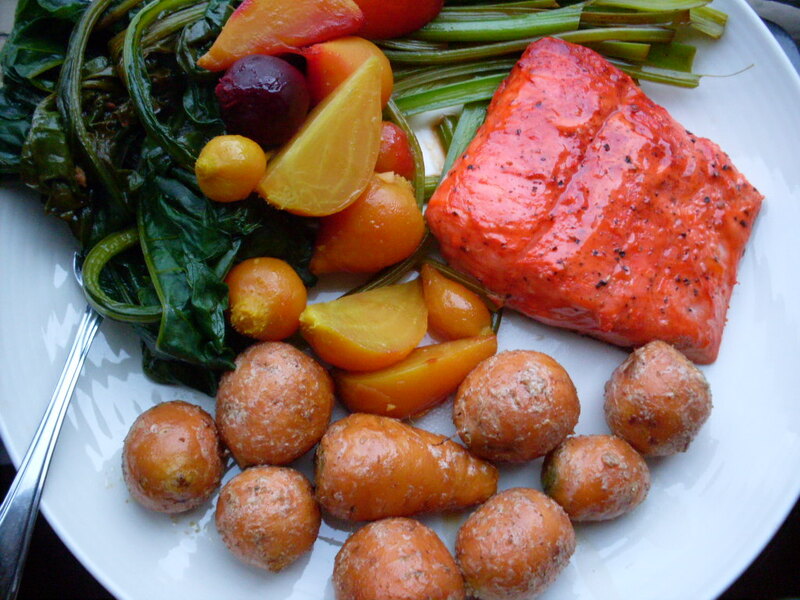 And I wasn’t going to post tonight, but then I threw together the easiest fish in the world, and it was so delicious and flavourful and red, and on the side we had the carrots and beets and beet greens we picked out of the garden the other day, and I wanted to tell you about it. It was a fresh, fast meal, and really quite perfect for if we were going to Fringe, because it took almost no time. I like to keep a stash of really bold spice blends on hand for occasions such as these, when you want a lot of flavour but don’t have a ton of time. I like Indian spices best, because they are warm and fragrant and often quite colourful. You should be able to buy tandoori masala in the Indian section of your local grocer. Failing that, you can pick it up at a specialty store, or buy it in paste form, which is also quite handy. Place halibut in a plastic bag with yogurt and tandoori masala. Squish it around until the spice has mixed into the yogurt and has coated the fish. Put the bag in the fridge. Go about your day. Before cooking, preheat your oven to 400°F. Place halibut on a baking sheet lined with parchment paper. Sprinkle with salt, and as much pepper as you feel like. I always feel like way too much pepper. Bake on the middle rack for 10 minutes, until just cooked through – you should see the fish just beginning to “flake,” where the grain of the fish starts to separate just a bit. If it’s a little thicker, give it a bit longer, but not much. Also, the carrots look weird because I roasted them with yogurt as well; they were very tasty, but not beautiful. I tossed them in a mixture of yogurt, lemon juice, olive oil, garam masala, and salt before roasting them at 400°F for 40 minutes. Skinnier carrots will take less time, fatter carrots: longer. 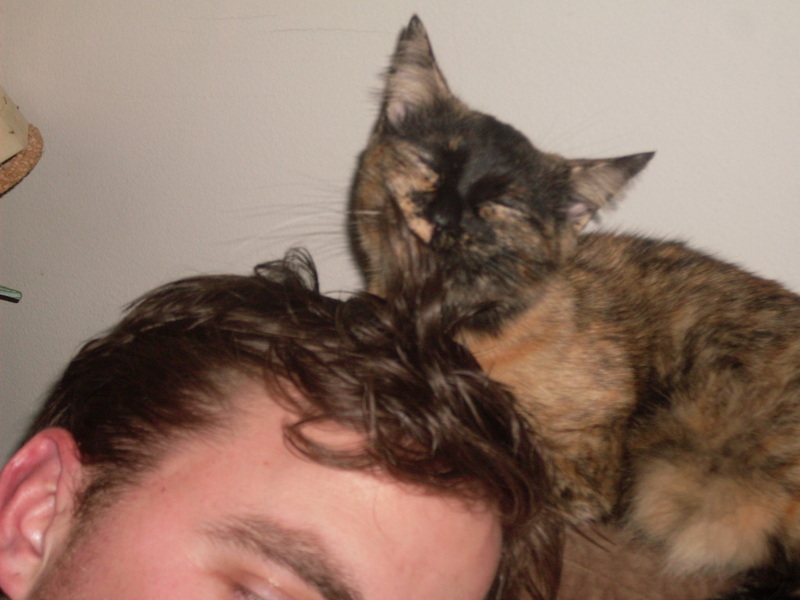 Here’s a picture of the Nick and the cat, in happier times and before I was legitimately considering stabbing him. Remember him fondly. He had a good run. < Previous Garden report: Just imagine excited shrieking and jumping up and down. Next > Stuffing ball soup. Aieee! I hate it when Date Night turns into Fright Night. I’m usually the culprit, though, I hate to admit. Pat can’t abide horror movies (if they don’t have monsters or zombies) because he doesn’t like seeing people be evil to one another. It’s one of his endearing traits.